Welcome to my garden - Please come in. Let's stroll along the garden path. The bees are busy with their daily chores. Looking ever so dapper !!! For another grandest of grand affairs !!!! Thank you for stopping by my Mad Tea Party, it was a pleasure to see you. I hope you enjoyed your visit. 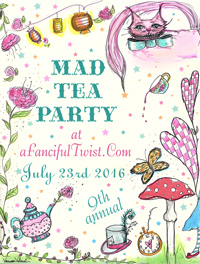 Thank you Vanessa, for putting together another fun Mad Tea Party, it was SO much fun. Who could possibly ever have enough sprinkles !!!! Footballs, flowers, hearts, googly eyes in every size, gold balls, silver balls .... the varieties are endless, and I'm always on the hunt for new ones !!! Decorated cookies and Sprinkles go together like tea and cake ....... you can't have one without the other. After hubby made me my cookie cutter board a couple of months back, I dreamed of a special place to keep all of those colourful little jars ...... that was until a week ago, when, while browsing the aisles of Hobby Lobby, I found my dream solution ...... Thank You, I'll take them as an early birthday present !!!! Can we all just say ...... Sprinkle Storage Perfection !!!!! Right down to their chicken wire doors !!!! Tennis themed cookies, to celebrate a senior who was signing with St Mary's University on a tennis scholarship. Cakes for our Senior Class of 2016 celebration, at Church. Congratulations Marcus High School Class of 2016 !!! A special order for a sweet graduate. Summer themed cookies, to show appreciation to an extra special teacher - we really couldn't have done it without her. A cookie prize for the winners of the game "Face The Cookie". Love these little hula girls !!! School's out for Summer ..... Cookies for an Hawaiian themed end of year party. Graduation cookies for a Texas A&M bound graduate. I hope your Summer is off to the most perfect start ...... a couple of months of long, lazy, scheduless days .... Ahh !!!!! I'm so happy to be popping back for a visit, with something fabric to share with you. It was once again time for myself and my two zombie loving friends to share another zombie exchange ..... it makes sure we keep our creative juices flowing !!! Val, our Zombie Chief, chooses the theme, and we get to it !!! We were to make a Zombie themed apron .... how we interpreted that, was up to us. I searched for Zombie fabric, but there is a definite gap in the market when it comes to this .... hint, hint all you fabric design guru's out there !!! So .... what is a girl to do ? Why, make my own zombie fabric of course !!! Val's preference was a café style, half apron. This one has a pocket that runs the whole width of the apron, which I then sewed into smaller pockets. Now just look who is popping out of her hiding place ..... Little Miss Springalot Zombie !!!! The apron is lined with the same mustard fabric, as the cuff on the pocket. I sewed the nice long, wraparound ties separate to the waistband, and attached them with 3 black button, just to add a little extra detail. I used a butchers apron pattern .... this apron was one of the first things I ever learned to sew !!!! Again, there are lots of pockets to tuck all those cleaning rags and dusters into. On Jill's apron, I included a clip at the waist, that has a little hand towel attached. I don't know about you, but to have a hand towel attached to me at all times when I'm cooking or cleaning is a gem. Her apron is lined with red fabric, with teeny tiny white polka dots on it. This little Miss ...... Dusty Zombie, is a little cheeky, I think ........ sticking her tongue out like that !!!!! Truth be told, she probably feels the same way as I do about spring cleaning !!! I found these plain, muslin dish towels at Hobby Lobby. I decided to zombie them up with some fabric paint. I sprayed the red paint over the entire towel, and let it dry. I then did my freezer paper stencil trick, with some zombie silhouette images I found on the internet. I sponged the black paint over the stencil, and then left the towels to dry ...... I'm so happy with how they turned out. I also included some zombie brain scrubbers ...... red ones to match Jill's color theme, and yellow to match Val's. Thanks ladies for another fun zombie exchange .... can't wait for the next one !!!! Another post from my kitchen - it seems the place I spend most of my time at the moment !!!! An arrangement of little spring flowers adorn the edge of the pie. I sat reading through some of my favorite blogs today - it's something I just love to do. There's SO much creativity and SO many ideas out there - inspiration abounds !!! In my own defense, I have spent a lot of time over the past 12 months, trying to grow my little cookie endeavor, and I've been over the moon excited by the response I have got. I couldn't be more thankful. When I thought a little more about my blog however, I realized that I am burnt out - not by my blog, but by what life has dished up to us over the past 6 or so years, and this has played havoc with my creativity - it's just not what it used to be. At the same time, this creativity brings me so much joy, as does sharing it. I want to ..... need to ..... find my way back to that creative place, I'm just not sure how to right now. Everyone in the family had a different favorite - only Andy and I chose the same cookie. Texas themed cookies ..... these cookies were placed in the hotel rooms of out of town wedding guests. I LOVED that idea, and it reminded me of my sisters wedding. We put goody bags in each guests room for her wedding. This was the sample picture I sent to the customer ....... only to find that she was an Aggie !!! This foreigner didn't even think of that .... needless to say the longhorn cookie was axed from the group !!!! Easter Cookies 2016 ...... so cute !!!! We (hubby and I), are on a "healthy eating plan " right now ..... we don't use the DIET word !!! These beauties had me a little worried to start, I'd never seen or heard of them before I was asked about making some for a bridal shower. Pinterest is a lifesaver !!!!! Love them .... so elegant !!!! 3 delicious shortbread cookies, sandwiched together with vanilla buttercream, and decorated however you wish. These were decorated in icing, colored to match the brides colors. These floral cookies were for the same bridal shower ..... the photo is awful (but it's the only one I have). The colors match those of the stacked cookies. It was raining cats and dogs when I took this picture, so the light was horrible. Hope you've found some time to be creative, it's so good for mind, body, and soul.